Caskey-Beazley, Attic Vase Paintings (MFA), no. 104. Side A: In center Zeus pursuing the nymph Aigina, (Most of his face and arms are lost). Aigina flees to right looking back. A sister flees to left. Meaningless inscriptions between the upper parts of the figures. Side B: An old man (Asopos Nereus?) standing, at right of picture, with scepter, is approached by a maiden with hands extended; between them an altar. Greek inscription “Nereus is handsome” (NEREUS KALOS). ‘Kalos’ between the woman and the tree and ‘Nereus’ between the tree and the man. Repaired with some restorations. On the front of this vase, Zeus can be seen pursuing one of the many objects of his affection, the Nereid Thetis. Zeus holds a scepter, identifying him as the ruler of the gods, and wears a tunic with an intricate design. 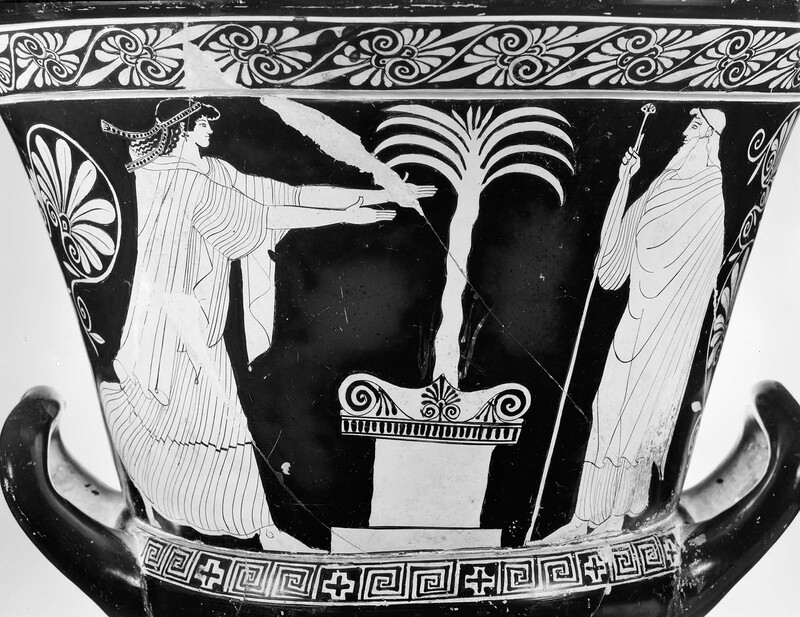 On the reverse of the vase, another sea-nymph rushes toward her elderly father, the sea-god Nereus, who stands by an altar. Nereus had fifty Nereid daughters, who are often identified by their elaborate headbands and who often carry fish as an attribute of their marine origin.